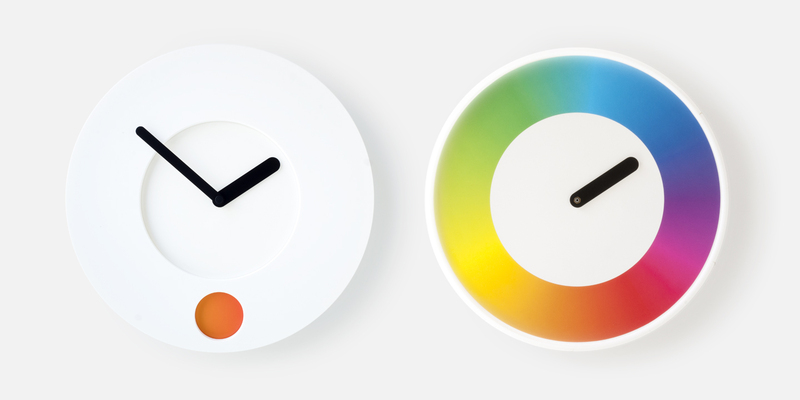 The hour hand/disc (shown on the right) is embedded within each minimal clock design, so the hand is literally mounted directly to the disc which features a full rainbow of colours. Once assembled into the minimal clock chassis, only a small portion of ever-changing colour is shown through the round window of the white clock face. The result is a clean, modern clock design that complements the wall of any minimalist interior, creating a more relaxed method of reading the time, not by number, but by colour. Our design studio’s approach to product design has always been to embed artistic concepts within the regular function of everyday tools and objects. When that blend is so subtle that you hardly even notice it at first, we feel we’ve achieved something that we can proudly share as a good example of modern, British design. This year’s going to be a big one for us for many reasons (we’ll share more soon! ^^). We hope to join the list of emerging designers to look out for in 2018!